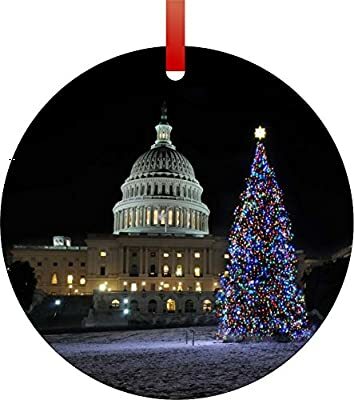 United States Capitol-Washington D.C.-on Christmas Eve-Double-Sided Round Shaped Flat Aluminum Christmas Holiday Hanging Tree Ornament. Made in the USA! Product prices and availability are accurate as of 2019-04-19 23:28:34 UTC and are subject to change. Any price and availability information displayed on http://www.amazon.com/ at the time of purchase will apply to the purchase of this product. High Quality Ornament; Smooth and Shiny Surface; Finely Crafted Edges; Comes with a Red Satin Ribbon ready for Hanging! 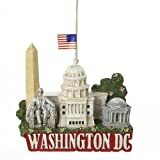 Measures 2.75" Round; Double-Sided Vibrant Image; This is a Flat, Round-Shaped Ornament. No 3d, or Textured Effects Quick Processing and Shipping! Satisfaction Guaranteed! Rosie Parker Inc.'s designs and images are registered with the United States Copyright Office. Copying, tagging, relisting, reproducing, claiming ownership, or resale of this design is forbidden without prior permission. Should We Be Alerted to Any Property Infringment, Immediate Legal Action Will Be Taken. ©rosieparkerinc. Unauthorized use and/ duplication of this material without express and written permission from rosieparkerinc is strictly prohibited.